Burgers are one of the easiest meals to make really well and with our special recipe, you'll be making world class burgers in a matter of minutes. This roasted homestay™ boerewors is the ultimate hearty meal. Imagine all your favourite Heritage Day food packed into a freshly-baked roll! 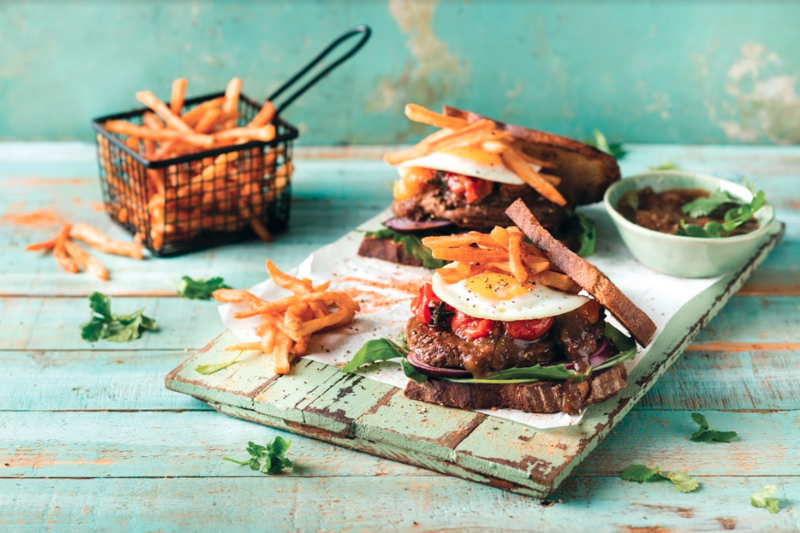 The Braai Day gatsby is the perfect combo of boerewors, potato salad and braai broodjie. This ultimate steak sandwich recipe will blow you away! Make this recipe and impress your family and friends. It takes just 15 minutes of prep and cooking time to craft four perfect prego rolls. Enjoy the sweet, spicy flavours and hints of lemon in this winning recipe. Serve 6 people in style with this gourmet jaffle recipe. It’s packed with flavour and takes just 25 minutes to make! The traditional favourite gets a surprising new look with this recipe. Serve up 6-8 croquettes, perfect for snacks and starters. This is a quiche for carnivores. Our unique recipe combines the traditional elements of great quiche-making with the distinctly South African flavour of biltong. This recipe brings the classic comfort of cheeseburgers and the salsa of Mexico! The result is delicious sliders with a twist. This recipe combines the delicious, local flavours of braaiwors and chakalaka. Together, they make the ultimate sausage roll! This curry mince has the traditional curried mince flavours! Add some peas, potatoes and chutney and serve with vetkoek or rotis. This savoury spice blend sticks to traditional curry flavours, including onion, garlic, coriander and clove. Strong flavours and a hot burn make it fit for a king! This beautifully balanced curry contains a flavour profile of garlic, onion and coriander. It has a medium burn and is perfect for chicken, mutton or lamb. This mild curry blend contains top notes of garlic, onion and coriander. It has a mild bite, as curries should. Try it with your favourite red meat! This mix makes a great Durban-style curry. It contains savoury beef flavours with top notes of onion and coriander. A great vindaloo has to turn up the heat and this spicy curry blend doesn’t disappoint. It contains top notes of cumin with a strong tomato flavour, making it perfect for beef. This mix is an excellent base for hearty and homely dishes. It works best with beef and venison — try it the next time you want to make a delicious cottage pie! This mix brings typical Italian and Mediterranean flavours into your kitchen. It’s great for making meals like lasagna and tomato bredie. This mix makes a rich brown sauce with strong onion notes. It’s perfect for hearty beef dishes and also works with oxtail. This beef flavoured gravy contains top notes of garlic and onion. Drizzle it on your meat to take your meal to the next level! Use this recipe to make to make tasty dried sausage cheese puffs at home! They're perfect for every occasion. Biltong is meat at its most versatile. With this recipe, you’ll find a new way to use it and make nachos even more exciting at the same time! If you need to whip up a delicious snack, this quick biltong pate recipe will sort you out in no time. It’s versatile, different and will get people talking! Need a quick snack or a light lunch? This biltong and avo sarmie recipe is perfect for lunchboxes and the flavours work so well together! Biltong makes everything better, especially pizza! Follow this recipe for a quick, easy meal that looks and tastes amazing. The Italians are renowned for their prowess in the kitchen. With our Sausage and Tomato Bake recipe, you'll feel European in no time. They say you shouldn’t put all your eggs in one basket, but they didn’t know about this great recipe! This Eggs in a Basket recipe is a tasty way to treat 20 people without spending hours in the kitchen. Breakfast is the most important meal of the day. With our Breakfast Tray Bake recipe, it can also be the most delicious! Follow the instructions to create an unforgettable start to the day.